Do you like those Sierra games, like "Kings Quest", where you have to collect items and use your wits to exchange them for other items? Then this game is for you! You are Dizzy- an enthusiastic adventurous egg who has to rescue his girl and save his egg townsfolk. The packaging of this game alone makes it a unique SMS game because the cartridge is shaped like an egg! Plus, you get a cool map/poster to help you through this game! This game follows in the style of traditional puzzle games like King Quest where you exchange items to overcome obstacles and explore the area. For example- you find a key to open a door, you throw meat to a beast to get past it, you find some weedkiller to use on a Venus fly-trap so you can walk past...the game involves Dizzy exploring the HUGE world (which consists of castles, pirate ships, tree houses, mine shafts, beaches and a graveyard) and picking up various items lying around (like keys, bottles, rope, an umbrella) and then placing them in front of a specific obstacle to get past (like you find a bag of gold coins on the ground which you eventually give to a castle guard to bribe him so you can go past) This sounds all easy. But you can only carry 3 items at a time- and to reach some further areas of the game you need more than 3 items. So, basically you spend your time travelling back and forth picking up various items and trying to remember where best you could use them. This might sound frustrating for some- but it was challenging for me! You also have to deal with enemies along the way such as ants and spiders. Dizzy can't kill any of these enemies so you basically have to jump over them or avoid them. With only 3 lives to begin with you can earn more by playing sliding puzzle games. Apart from the puzzle solving- there are a variety of side quests/games you have to complete to finish the game such as riding a mine cart through an abandoned mine and being stuck at the bottom of the ocean and catching floating bubbles up to the surface. These diversions make the game more interesting. The instruction manual that comes with this game actually shows screen shots from the MegaDrive version so it looks more cartoony with more background details but the SMS graphics aren't that bad. 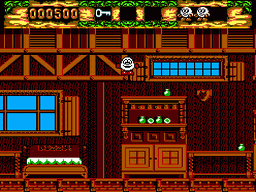 Apart from Dizzy just being a plain white egg with red gloves and shoes the rest of the game graphics are pretty cute. 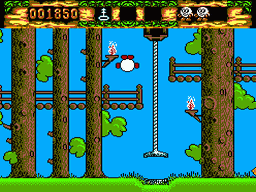 You get the standard theme backgrounds- like a spooky forest with graveyard stones and spiders and cobwebs and the pirate ship has barrels of rum and planks everywhere but if you look past the stereotypes of the layouts it does the job well with loads of bright colours and interesting sprites. The background music changes to the appropriate location you are in. So it is standard sea-shanty music in the pirate ship and hammering/tinkering music in the mine shafts. You get a cute little melody noise whenever you complete one of the tasks such as getting all the ingredients for a medicine and putting them in a pot. 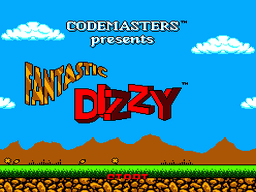 The main problem with controls is that when Dizzy is standing still he can only jump straight up- you can't position him near the end of a platform then jump and hold the directional arrow across to land on the next ledge. You can basically only do running jumps which is really tricky because Dizzy doesn't land on the next platform but does an "egg roll" and you can't stop him rolling. I spent AGES trying to get a treasure chest from the sunken wreck in the ocean because the three separate platforms in between were so tiny Dizzy kept rolling down! Apart from the jump situation the only other options are to pick up items or to drop items. This is not really a game for action fans as this game depends on basically jumping over enemies and avoiding them rather than destroying them. This is not a game you will finish in one sitting. Because there is no "Continue" option you basically have to use your 3 lives carefully or win more in the sliding puzzle games. I can't quite put my finger on it...but this game is addictive and certainly had me wanting to keep playing because every time you play you get a few more steps forward. Like, you will find a new item which you can use to move another obstacle. Considering you have to find 250 stars located around the map and compete in a series of side events- the replay value of this addictive game is high! Such an underrated gem! This game has strategy/puzzles similar to 'Alex Kidd in High Tech World' and 'Kings Quest' but the graphics/platforms remind me of 'The New Zealand Story'. Because the game looks cartoony some people might dismiss it as just a kid's game...but it requires a lot of patience and thinking to actually move through this game alive!